German Mauser C96, Famous from James Bond & Star Wars! \The Mauser C96 is a semi-automatic pistol that was built by the German arms manufacturer Mauser from 1896–1937. The C96 gained fame in recent times thanks to two popular series. Author Ian Fleming outfitted SMERSH agents in the James Bond series with Mausers after receiving advice from firearms expert Geoffrey Boothroyd. 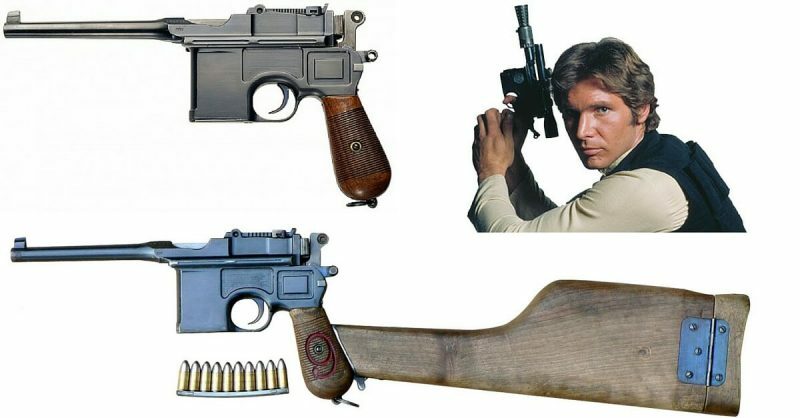 Later, a C96 was modified to form Han Solo’s blaster pistol in the Star Wars movies. Reproductions of the blaster became so popular among fans that gun collectors started noticing the increasingly rare original Mausers were being bought and altered to make replica blasters. The C96 also played a starring role in many Soviet films as the iconic weapon of the Russian Revolution and ensuing civil war.